Here we go, the real purpose for this website: To provide independent, off-the-beaten-track information on things that locals know best. 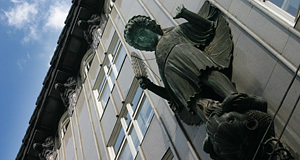 One of the most central attractions of Vienna, yet also one of the most neglected ones is the Zacherlhaus, an Art Nouveau or Jugendstil building that holds a crucial position in the Austrian history of architecture. You find the Zacherlhaus only some three minutes from the Stephansdom, the most significant landmark of Vienna - nevertheless, almost no tourists at all ever make it there and acknowledge the building′s significance. Finding it is fairly easy: From the Stephansplatz square, move southwards and enter Brandstätte. The Zacherlhaus comes two blocks further, on the corner to Wildpretmarkt. The entrepreneur Johann Zacherl made a fortune in the 19th century with the production of insecticides, mostly for the use in private households. It is important not to confuse the building called Zacherlhaus in the first district with a building of the same name in Döbling. The latter one was the family′s insecticide factory and better known in Vienna, because it was built in the style of a Mosque (probably because it′s purpose was to kill Mosque-itos). This Zacherlhaus is seen as a key building of the Vienna historicism. The one in the first district, on the other hand, is a very modern building in the tradition of Otto Wagner. It was designed by one of his students, the Slovene Joze Plecnik, and built between 1903 and 1905. The landlord was Johann Evangelist Zacherl, the son of the founder of the Zacherl factory. Note the façade of the Zacherlhaus: It is covered in grey, polished plates of granite. The building was also celebrated for its unusual roof. The inside of the Zacherlhaus has a central staircase and chandeliers that were inspired by the body shapes of insects - a reference to the Zacherl family business. Art historians consider the Zacherlhaus the first modern piece of architecture in the first district - with others, now more famous ones, to follow soon: The Postsparkasse or the Loos Haus, for example. Following WWII, the building had to be refurbished in 1949. Today, it is listed and still owned by the Zacherl family. It is used as an office building and its inside is not open to the public. The foundations of the Zacherlhaus were built from concrete with steel inserts - today common practice, back then a revolutionary technique. Note that all doors and windows are still the original ones from 1905. Attractions nearby are very numerous - here only a selection of the closest ones: The Peterskirche, the Judenplatz, the Altes Rathaus, the Bohemian Chancellery, the Hoher Markt Square with the Ankeruhr Clock, the Am Hof Square, and the Graben shopping area with the Plaque or Trinity column.